This Gojo Touch-Free Dispenser features a high-capacity design that is great for high traffic areas and requires fewer changeouts. The LTX-12 Hand Soap Dispenser offers touch-free, trouble free performance in an appealing black & chrome color. The touchless design reduces the risk of cross contamination and germ spread by eliminating a shared touch surface. The Gojo LTX-12 Touchless Soap Dispenser features Gojo Smart Electronics technology that minimizes energy use per actuation, eliminating need to change batteries over the life of the system in most installations. This means you save time and money with this dispenser. This automatic hand soap dispenser also features a large sight window & skylight to make it easy to check fill status, taking the guesswork out of determining when a refill is needed. The Gojo LTX-12 is fully ADA compliant and comes with 3 "C" alkaline batteries already installed. 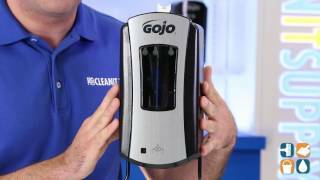 Gojo offers a lifetime guarantee for this unit that even includes the batteries. 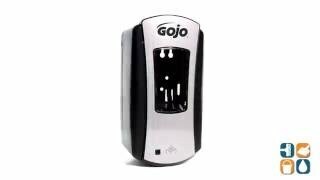 The Gojo LTX-12 Hand Touch-Free Hand Soap Dispenser is ideal for use in any high traffic location.